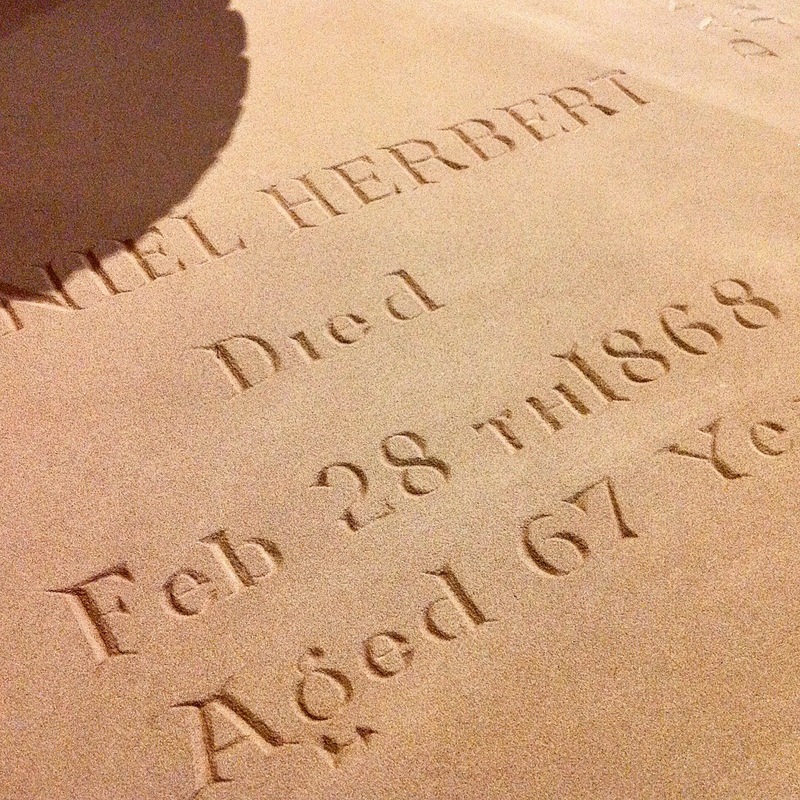 Carved in local Ross sandstone, we have a full sized replica of Daniel Herbert’s grave. 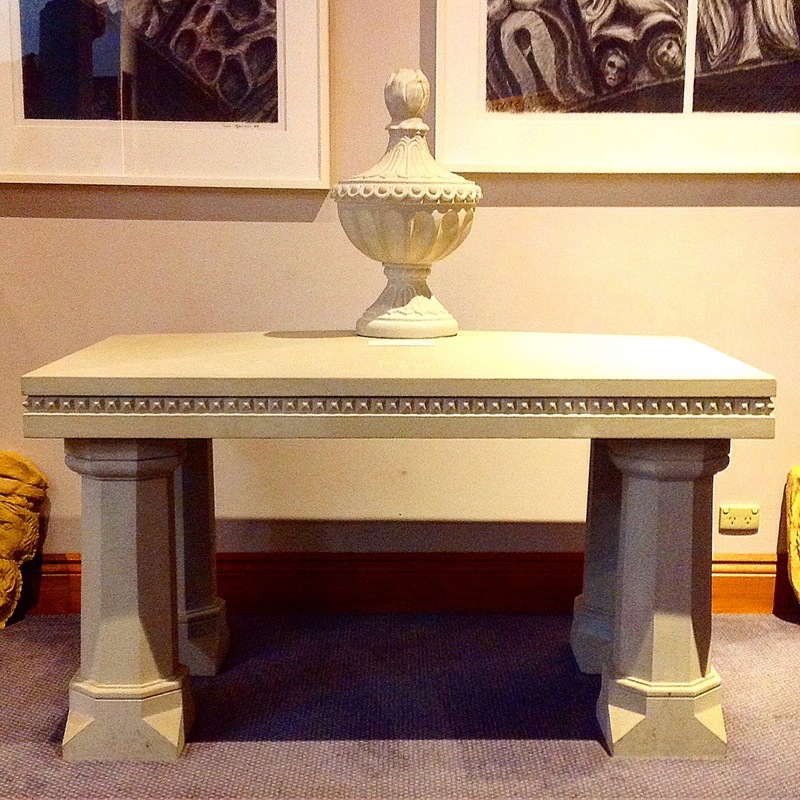 A tabletop stone mounted on four faceted legs and topped with a classically shaped and fluted urn. Inscriptions run along the edge of the tabletop. 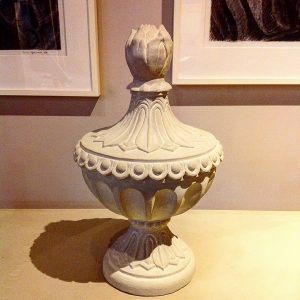 The urn features several classical carved motifs including an egg and dart border trim, incised fluting on the body of the urn and acanthus leaf detail on the base and lid. The stylised flame on top is often used on gravestones to represent the soul rising from the ashes of death. Acanthus is also symbolic of enduring life and the egg and dart of life and death. The Tasmanian Wool Centre with the descendants of Daniel Herbert, supported by the Tasmanian Government and the Tasmanian Heritage Council undertook the project in 2005. It was created by talented stonemason Les Kulinski. The original stone is located in the Original Burial Ground in Ross. Only a fragment of the original urn has survived, and Les Kulinski was able to create the urn from a drawing of the design by Herbert. Herbert carved the original stone for his son Ernest Henry who died in 1846, aged two. Herbert himself died in Hobart in 1868. We do not know how the stone came to be used for Herbert’s own grave. Daniel Herbert was one of the convict stonemasons who worked on the Ross Bridge. Prior to being transported to Van Diemen’s Land, he worked as a signboard writer and stonemason in Leeds. Charged with highway robbery in 1827, Herbert was sentenced to death. His sentence was later transmuted to transportation for life and he arrived in Tasmania in 1827. Herbert worked on a range of building projects including Customs House in Hobart before being transferred to work on the Ross Bridge. He and fellow convict stonemason James Colebeck were both promised conditional pardons if they completed the bridge in an agreed timeframe. The 186 carvings on the bridge’s keystones are attributed to Herbert, generally held to be carved by him or under his supervision. They were completed in fifty-six weeks, and his pardon was granted. Herbert continued to live in Ross working as a stonemason. The artistic merit of the bridge carvings, as well as the artisan skill they demonstrate, has long been recognised. In a letter to the TWC, the artist John Coburn stated that “Daniel Herbert is, in my opinion, the most important sculptor of the early period of Australia and stands with John Glover as one of Australia’s most significant artists”. In a broader context, this replica represents a continuation the long history of stone masonry and carving in Ross. 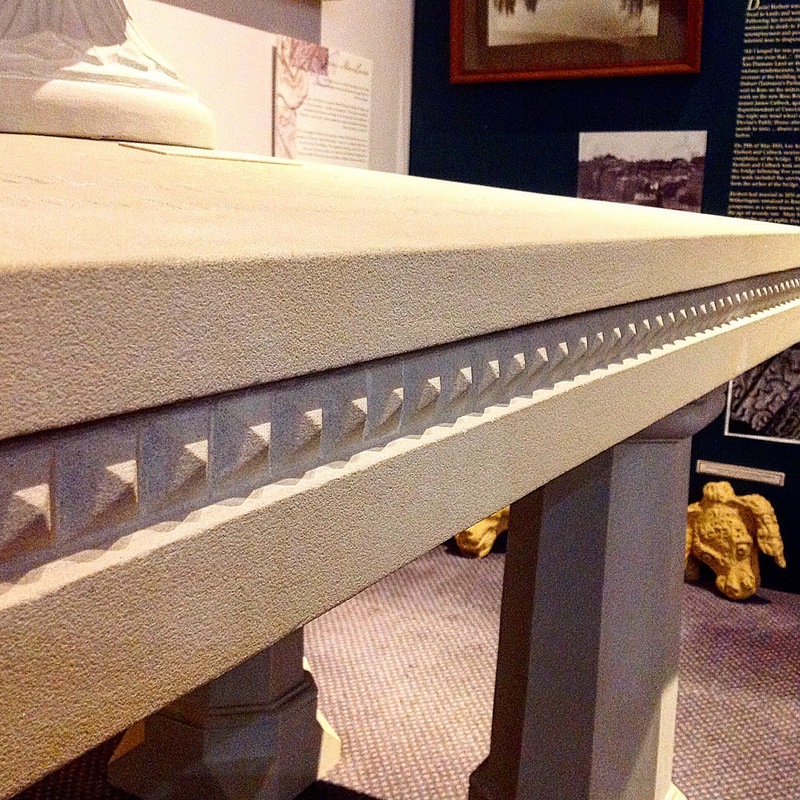 The replica demonstrates the characteristics of Ross stone. Ross stone is particularly fine-grained sandstone, and a distinctive pale grey in colour. It is relatively easy to work with and is ideally suited to fine detail. Unfortunately these characteristics can also make it prone to weathering and damage. Ross stone is also known to produce exceptional grindstones. The stone has been quarried in Ross from he earliest days of settlement at several small quarries around Ross. The main quarry, where today colonial working faces are still visible, is located on the hill to the southeast of the township.